Asafoetida is a hard aromatic resinous gum collected from several species of plants belonging to Ferula family. It is known as Hing in Hindi. It is also called devil's dung because of its strong pungent smell due to the presence of sulfur compounds. It is sold in blocks or pieces as a gum and more frequently as a fine powder, sometimes crystalline or granulated. Asafoetida contains gum, resin and essential oil in varying proportions, which together are responsible for the strong flavour. In making commercially ground asafoetida the resins are combined with small quantities of rice, barley or wheat flour to prevent lumping and to reduce the strong flavour. Its odour is so strong that it must be stored in airtight containers, otherwise the aroma will contaminate other foods stored nearby. 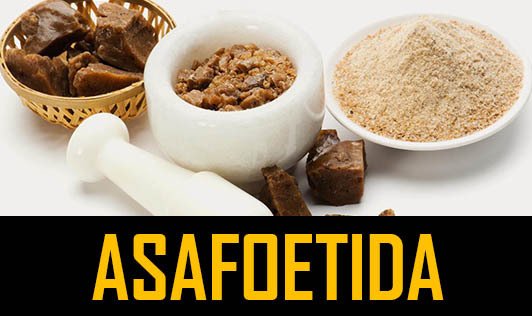 Processed asafoetida often varies in colour and texture because of the difference in additives. It is available as either mustard yellow powder or sandy brown coarse powder. Noteworthy nutrients in this spice are calcium and iron - 100 grams of this spice has 690mg of calcium and 39.4mg of iron. South Indian vegetable curries are often garnished with a large pinch of asafoetida sautéed in a spoonful of oil or ghee. When asafoetida is added to hot oil, it changes from its strong and powerful smell to an enticing aroma. It is also used in the cooking of various pulses, snacks, pickles, and in chutneys. Jain communities and strict vegetarian diets of India forbid the use of onions and garlic, and asafoetida is used in their place for its distinct aroma. In Ayurveda, asafoetida is used to stimulate appetite and digestion and reduce flatulence.